AMF bowling - East Cork Superbowl - State of the art AMF bowling lanes with a computerised bowling system that keeps the score for you. All you have to do is enter your name! 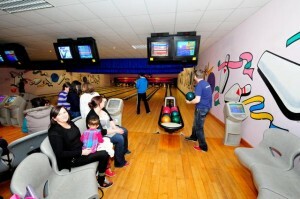 For the smaller kids there are bumpers lanes and light weight balls. AMF bowling – East Cork Superbowl State of the art AMF bowling lanes with a computerised bowling system that keeps the score for you. All you have to do is enter your name!! For the smaller kids there are bumpers and light balls. PRICES ARE PER LANE AND CAN ACCOMMODATE 8 PEOPLE. PLEASE NOTE THAT BUMPERS ARE FOR SMALL CHILDREN ONLY. 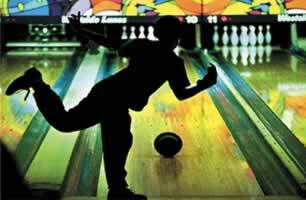 Rock ‘n’ Bowl Nights – Bowl to the beat of the disco music. Live DJ. Spot Prizes. School Tours – We aimto cater for all ages. If you are passing through after a day out or decide to make Youghal your location for entertainment we are able to cater for your needs. 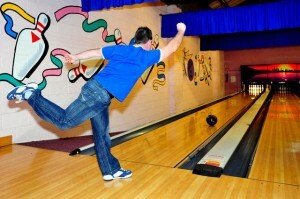 We operate a loyalty card system in which you collect stamps every time you play bowling. When you fill your loyalty card you can redeem it for FREE Bowling, Lazer Tag and Blackbeards Adventure Playcentre. Ask at reception for further details on this great offer. Tea, Coffee, Minerals and Snacks are available from our Fast Food Restaurant.